Party season is well underway and I wanted to show some of the star products I have been testing that are perfect for this time of year. A lot of these are new to me products, with a few old favourites thrown in. I have quite limited time to get ready this year as I have Baby Green to keep me busy so I am keeping it simple with speedy products. I start by tying my hair back and I am currently using these cute little Pop bands in festive colours, these are great because they are gentle on the hair. Before a special occasion I always cleanse my skin with the Oskia Renaissance Cleansing gel, this cleanser is softening, brightening and I know my skin loves it so it’s an easy choice to make. It always makes my skin look better and is quick and easy to use. Next I apply a nice creamy hydrating mask. Although the weather is quite mild for the time of year in the UK I generally find the extra alcohol and excess tends to dry out the skin more than usual so this step really helps make up to sit better on the skin. I have a couple of options for you that I have used and loved. The Sukin Hydrating mask is a lovely gentle and soothing mask, perfect either before or after partying, it has mango, avocado and papaya and leaves the skin soft and plump. I am also a big fan of the masks from Ooharr, these come in a sachet and you get two uses out of each. The Fruity magic mask is wonderfully plumping and hydrating and contains pomegranate and squalane, these are gorgeous for skin that is dull, dry and in need of some TLC. I have really dry skin so I use oils and butters on my butter daily, but before going out I like to apply a light lotion that keeps dryness at bay but allows me to get dressed immediately. The Avril – Organic body lotion is perfect for this, it’s a budget friendly body lotion that is cooling on the skin when applied and contains Aloe Vera and Shea Butter. When it comes to natural deodorants that will last 24 hours, few come close to Schmidt’s, I love this deodorant because it is so incredibly reliable and is my number one choice when I am going out. After I removed the hydrating mask I spritz my skin with a cooling toner, the Mel Millis – Rose Hydrolate is one of my favourites, just perfect for getting rid of any redness. Whilst the skin is still damp I apply a couple of drops of serum, I am currently testing the Tropic – Super Greens nutrient boost serum, which is like a green smoothie for your face. Packed with botanical ingredients such as Kale, this serum is light and easily absorbed and perfect for giving a nice glow. For any spots I apply a bit of the Lue – Clear spot treatment, this is an amazing herbal treatment that acts really quickly to take down any swelling or redness, it has become a new all time favourite! For hair I like to keep it quite simple. I apply the Ogario Styling mist to damp hair and rough dry it and then take sections and create waves using my GHD’s. The styling mist not only helps to keep the style all night long, but it has Argan oil and Keratin so it helps with condition and shine. Although on a daily basis I prime my skin with face oil only, for a special occasion and when I need my make up to last I apply a primer. The only primer I have found I have ever liked has been the The Works – In transit camera close up, it doesn’t feel silicone heavy like most primers on the market and it keeps dry patches at bay and my make up in place and feeling comfortable. It is one of the more hydrating formulas and I use it instead of a moisturiser, not the cleanest out there, but clean enough for me for special occasions and the fact that it works so well means I happily make an exception. I don’t think you can go wrong with a classic red nail and I will painting mine with Rouge Vermillon from Avril, these are a great free from formula that comes in at a great price point. Avril has been one of my favourite budget discoveries of the year! To go with the red nails I will be wearing a red lip, again from Avril the lip pencil in Griotte is the perfect bold lip with a hint of sparkle. These are easy to apply and great for chucking in your handbag to reapply on the go. It has a fairly matte formula so I like just a hint of gloss too, I am currently obsessed with the Tropic Skincare – Lip glaze in Sugarplum which goes really well with the deep pink undertones of the lip pencil and feels fantastic on the lips. For eyes I am adding a hint of sparkle with the Ere Perez – Creative Chamomile eye duo in the shade Very Important. It is talc free and such a silky eye shadow duo, it has a warm shimmery bronze and a darker matte chocolate brown and I absolutely love it for creating a really simple but beautiful eye look. Lastly to keep the skin from looking too shiny I will applying a light dusting of my trusty RMS un-powder, in my opinion the best powder on the market as it feels like silk on the skin and is light as a feather. I hope you all have a wonderful holiday season. 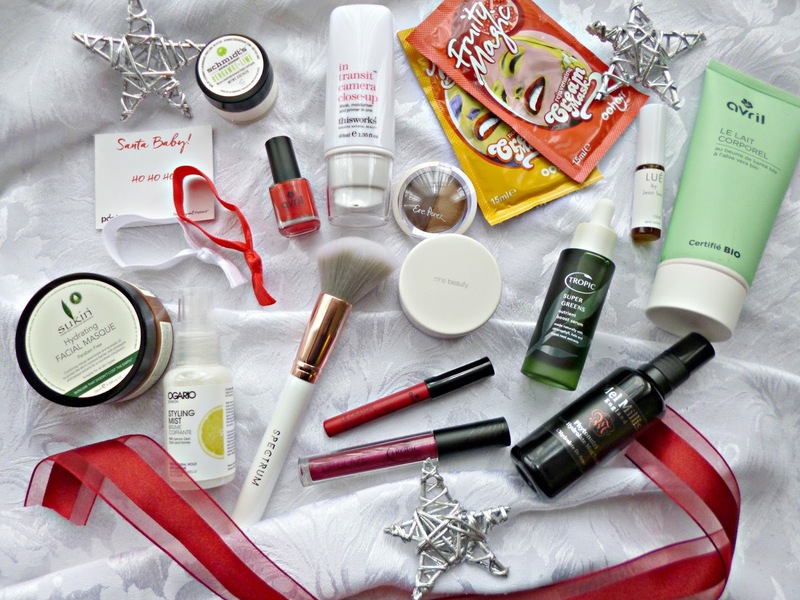 What products will you be using this festive period?